It’s always an honor and a privilege to help folks preserve, celebrate and share their life stories. And sometimes those folks live in fabulous places, like Hawaii! I’ll tell you all about our recent Hawaii shoot in the July e-Newsletter. This month, we celebrate another video biography award and address the issue of gathering family photos for use in legacy videos. Oh, and I’m also hoping you’ll tell me what social media sites you prefer. Family Legacy Video® wins a Telly Award! Tucson’s Family Legacy Video, Inc. and its president, Steve Pender, have been honored by the 35th Annual Telly Awards for the company’s video biography work. Family Legacy Video competed with nearly 12,000 entries from all 50 states and numerous countries. Pender and his company were recognized for a video biography celebrating the life story of George Tullock, who emigrated from Scotland to the U.S. in 1839. It was commissioned by Tullock’s great-granddaughter, Mary Louise Tullock Gunderson, and her husband, Bob Gunderson, of Des Moines, Iowa. 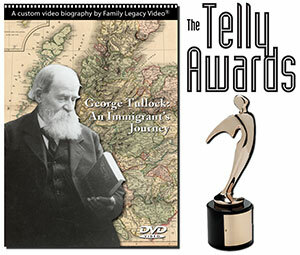 The Telly is the fourth award won by Family Legacy Video in 2014. You can watch a clip from the award-winning video here. What social media sites do you prefer? There’s no doubt about it: Social media can play a major role in helping to spread the word about the importance of preserving our life stories for generations to come. The question is, which outlets would work best? Would you take a moment to let me know which social media site or sites you use? Just click on this e-mail link, type in the names of the sites you like the best, and click “send.” I’ll sure appreciate your feedback. Thanks in advance! WHAT FAMILY LEGACY VIDEO WILL DO NEXT. Of course, there’ll come a time (usually after you receive the Final Wish List) when I need you to tell me I’ve gotten all the visuals you can provide. Once I get that word, I’ll focus on using the images I have to their greatest effect.